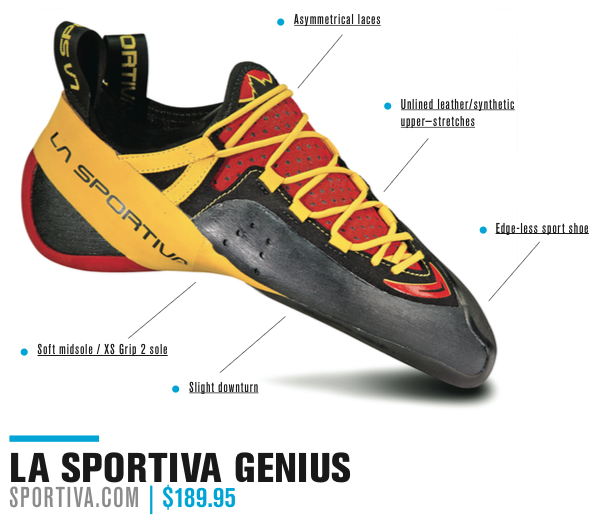 Touted by Sportiva as “the highest performance climbing shoe on the market,” the Genius incorporates the latest of Sportiva’s thinking—No-Edge technology, P3 randing and asymmetrical lacing—into one package. 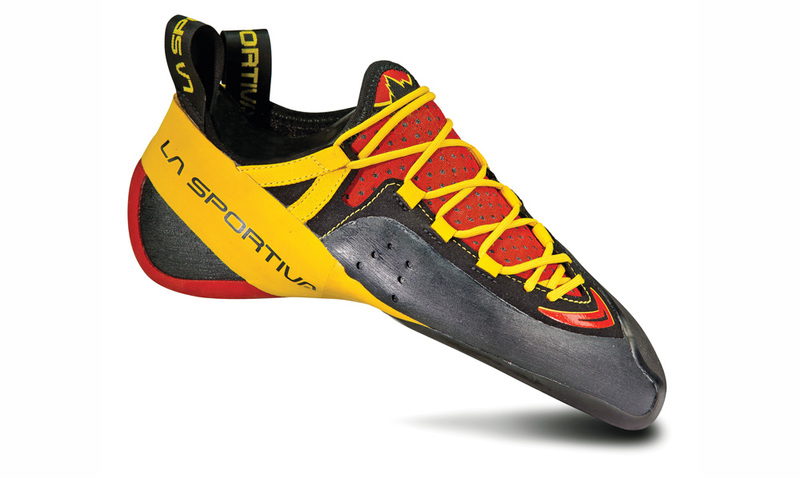 In 1999, Sportiva’s designer, Pietro Dal Pra, took a thin section of sole rubber and wrapped it up and around the front platform of a sock-soft shoe called the Mantra. Predictably, this design, which lacked an edge, had proponents and detractors, but the Mantra quickly became my favorite shoe for caves and hold-less feature climbing. The rounded-off toe smeared better than a true edge—and still does. 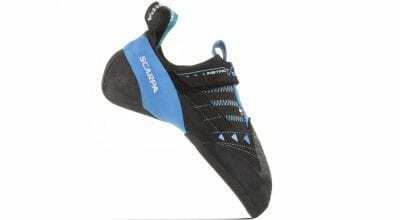 Doubters, take note: Adam Ondra used the no-edge Sportiva slipper, the Speedster, to onsight 5.14d. Aside from having the no-edge, here’s the skinny on the Genius: It is a super-soft slipper-like shoe that fits my narrow feet like a glove. The P3 platform, a rubber rand that wraps around the heel and under the sole, drives the toes into the end of the shoe, helps maintain the slightly downturned shape. The toe box is designed to accommodate knuckled-up toes, but I wound up sizing these shoes one up from what I usually wear in Sportiva—and they still hurt for a few sessions before the unlined leather stretched. Dal Pra lists a host of advantages for the no- edge design, ranging from greater durability to better sensitivity. In my experience, he’s correct that the no-edge takes longer to wear out because the point of contact with the rock is more spread out than with edged shoes. The beveled toe also smears without rolling. You may note than an edged climbing shoe eventually wears into a “no edge” sole, so what’s the big deal with the Genius? 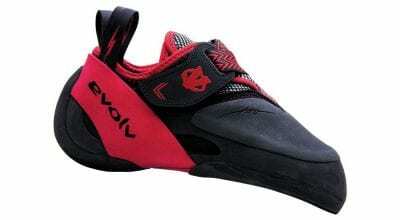 The Genius, unlike your worn shoes, is purpose built for no-edge climbing, performing at its optimal level on day one. I also agree with Dal Pra that the no-edge climbs better in many instances. In most cases—even when toeing edges—the toe contacts the foothold as a smear, not by butting the very edge of the shoe to the hold. Imagine bouldering in a steep cave where you paw at a bucket or on a slab where you smear across a tiny wrinkle. Of course, there are times when you’ll want a traditional, edged shoe—namely for vertical climbing on sharp, small holds and thin cracks where a thinner toe profile will allow more penetration. That said, the Genius has become my go-to for steep bouldering and all types of sport climbing with the exception of vertical edge climbing, where a traditional flat-lasted, stiff, edged shoe will ameliorate foot fatigue. At $189.95 the Genius pushes pricing to a new level, but only by $5, and Rock and Resole can resole the Genius for $45.